This article is about the American football defensive end. For the comic book artist, see Brandon Graham (comics). Brandon Lee Graham (born April 3, 1988) is an American football defensive end for the Philadelphia Eagles of the National Football League (NFL). He was drafted by the Eagles in the first round of the 2010 NFL Draft with the thirteenth selection in the draft and the first from the Big Ten Conference. He played college football at Michigan. After completing his career as defensive end for the 2009 Michigan Wolverines football team, he had a total of 29.5 career sacks and 56 career TFLs for the Michigan Wolverines football team. In 2008, he led the Big Ten Conference in TFLs (20 in 11 games). In 2009, he posted 26 TFLs and 10.5 sacks in 12 games. As a member of the 2008 Michigan Wolverines football team he earned Second-team 2008 Big Ten All-conference recognition from both the coaches and the media. He was a finalist for the 2009 NCAA Division I FBS football Hendricks Award. He was a First-team 2009 All-Big Ten selection by the coaches and media. He was named to several First-team and Second-team 2009 All-America lists by various publications. Graham was also named MVP of the 2010 Senior Bowl. As a youth, Graham played football for the Police Athletic League Detroit Giants for seven years until joining the eighth grade team. Born and raised in Detroit, Graham attended Crockett Vocational Tech, a school that began participating in Michigan High School Athletic Association (MHSAA) football competitions in 1996 and that did not have a proper locker room for its football team before moving in his senior season. Since the football field had no lights, parents had to shine their car lights on the field for late practices. At Crockett, Graham. who had been playing competitive football since age seven, was expected to make an immediate impact upon joining the football team's starting lineup as a sophomore, and at the end of the season he was recognized as an honorable mention lineman 2003 All-Detroit selection by The Detroit News. As a junior, Graham served as linebacker, offensive guard, placekicker and punter for his team, and he led his team to the MHSAA state championships, while becoming one of three juniors named to the 2004 First-team All-Detroit team with one source listing him as a placekicker and the other as a linebacker on the team. Crockett won Detroit Public School League Division 1 championship game at Ford Field and entered the Division 5 MHSAA semifinals with a 12–0 record, but Crockett lost 9–0 to defending state champion Lumen Christi Catholic High School. In addition to recording 91 tackles (20 for a loss), he maintained a 3.8 grade point average. In one game, he posted twelve tackles, four sacks, four forced fumbles, two blocked punts and scored on a 78-yard fake punt. He was selected for the Associated Press first-team Class B all-state team as a linebacker. In high school, Rivals.com ranked Graham as the top class of 2006 high school football prospect in the state of Michigan, the number two inside linebacker prospect and the overall fifteenth best prospect in the nation. Scout.com listed him as the number three linebacker in the nation and described him as the number one overall prospect in the midwest. Scout also described him as "arguably the best inside linebacker in the nation". ESPNU ranked him as the number two inside linebacker and number thirty-one prospect in the nation. Recruiting analyst Tom Lemming, listed Graham as the best linebacker in the country for USA Today. The Atlanta Journal-Constitution listed him at 15th among their national top 25 prospects. Entering his senior season, he was the overwhelming selection as the best high school football player in the state of Michigan according The Detroit News. He had run a 4.43-second 40-yard dash at the Nike Summer football camp. As a senior, he intended to also play tight end and fullback. One Detroit News preseason analysts listed him at linebacker, tight end and offensive guard. During the season, after missing four weeks to a knee injury, Graham was chosen as one of 78 players to participate in the January 7, 2006 U.S. Army All-American Bowl at the Alamodome. He was also named as a finalist for both the Parade All-America High School player of the year (The high school equivalent of the Heisman Trophy) and the Walter Payton Trophy. He was elected captain of the East team at the U.S. Army All-American Bowl and recorded four tackles as well as a blocked field goal in the game that also featured two of his Michigan teammates: (Justin Boren and Stevie Brown). There were only 16 finalists for the Parade award, including future Michigan teammate Stephen Schilling and future Heisman-winner Tim Tebow. Graham led his team to a rematch against Lumen Christi, which they lost 35–21 in the MHSAA Division 5 district championship game. In Graham's three years at Crockett, they went undefeated in the regular season and as a senior he was again selected to the All-Detroit first-team as a linebacker. Graham was also selected as to the Associated Press Class B All-State football team as its player of the year. The Detroit News selected him to the All-Class state Dream Team. He was also selected as the All-class statewide best linebacker as part of the inaugural class of The Michigan Prep Football Great 8 awarded by the Mid-Michigan Touchdown Club for being best at his position in the state. By his senior year, he had a 3.2 grade point average. Since Graham was the first Michigan athlete to play in the U.S. Army All-American Bowl, he was not aware that he was violating Michigan state rules by participating in an out-of-state all-star game. He had to surrender his high school athletic eligibility for the winter and spring seasons. During his time away from athletics, he overate and added 40 pounds (18 kg). Although he had been recruited as a linebacker, with the additional weight he was moved to defensive end. As he lost the excess weight he began to realize that he could excel at a lighter weight. For his athletic excellence, Graham received many honors. Among the recognition he received are Parade Magazine All-American, EA Sports All-American, USA Today All-USA High School All-America first team (No. 14 player in the nation by USA Today), Michigan Gatorade Player of the Year, first player from the state of Michigan to play in the U.S. Army All-American Bowl, 2005 Detroit News No. 1 Blue Chip prospect, and No. 2 on the Detroit Free Press Best of the Midwest rankings. Additionally, he was recognized as one of ten top prep athletes in Michigan in 2005-2006, including men and women from all sports, as a 2006 McDonald's-Powerade Tomorrow's Winners honoree at the Michigan Sports Hall of Fame dinner. "Michigan Football Commitments". Rivals.com. Retrieved 2009-10-01. "2006 Michigan Football Commits". Scout.com. Retrieved 2009-10-01. "Scout.com Team Recruiting Rankings". Scout.com. Retrieved 2009-10-01. "2006 Team Ranking". Rivals.com. Retrieved 2009-10-01. Graham arrived at Michigan measuring 295 pounds (134 kg) and 6 feet 2 inches (1.88 m). Graham was initially listed as a linebacker at Michigan, but before the 2006 NCAA Division I FBS football season started for the 2006 Michigan Wolverines football team he switched to defensive end. Graham was (along with Greg Matthews, Carlos Brown, Brandon Minor and Stevie Brown) one of five true freshmen to play in the season opening game. Graham was the backup for 2006 Lombardi Award and 2006 Ted Hendricks Award winner LaMarr Woodley. Graham also performed as a reserve defensive tackle during the season. Graham made his first tackle for Michigan on October 28 against Northwestern and recorded his first sack and forced fumble on November 11 against Indiana. As the 2007 Michigan Wolverines football team prepared for the 2007 NCAA Division I FBS football season, Graham got some unusual news off the field when he found out that he had been given a perfect 99 rating in the NCAA 2008 EA Sports even though his star teammates Chad Henne, Jake Long and Mike Hart had not. Also, off the field, Graham was issued a ticket playing loud music in a vehicle on July 24 and missed the September 18 court date after pleading not guilty. This caused a judge to issue an arrest warrant for failing to appear in court on a disorderly conduct charge. The charges were dropped under the belief that he had been misidentified. At the start of training camp, he weighed 262 pounds (119 kg) and was the projected starter at defensive end. Although projected to as the starter, Graham played sparingly in the opening game loss to two-time defending FCS champions Appalachian State Mountaineers on September 1. Head coach Lloyd Carr noted his disfavor with Graham at the start of the season: "Brandon, he needs to get focused," Carr said, "and do the things that he's capable of doing." He was disappointed in Graham's efforts in practice. In the third game, on September 15 against Notre Dame Graham recorded 3.5 sacks in the rivalry game to help lead Michigan to its first win of the season. The following week he had 1.5 sacks, a forced fumble and a fumble recovery in a victory against Penn State. Over the course of the season, he started six games at defensive end. He led the team in sacks with 8.5 and was second in forced fumbles with 3. He ranked seventh in the Big Ten for both statistics. He was a mid-season Ted Hendricks Award watch list candidate. Graham during coin toss with Tim Hiller and teammates Carlos Brown, Zoltan Mesko and Mark Ortmann. Graham, who had been troubled by conditioning issues the prior season arrived at spring practice in very good shape, which pleased newly arrived head coach Rich Rodriguez, who was welcomed by a defensive line composed entirely of returning starters, including Graham. Graham began the 2008 NCAA Division I FBS football season as a Hendricks award watch list candidate for the 2008 Michigan Wolverines football team. However, the team began the season unranked in the Associated Press poll for the first time in 23 years. On September 27 Graham had 3 sacks and 2 forced fumbles against the Wisconsin Badgers, and he was named Big Ten Conference Defensive Player of the Week. Prior to the October 25 Paul Bunyan Trophy game against Michigan State, Graham guaranteed a victory. Although the team lost 35–21, Graham again recorded three sacks. Graham finished the season with 10 sacks. He led the Big Ten with 20 tackles for a loss (TFL) and 1.82 TFLs per game and was second with 0.91 sacks/game. He ranked second nationally in tackles for loss and tied for eleventh in sacks. After the season, he was recognized as a 2008 Second-team All-Big Ten Conference selection by both the coaches and the media. Graham was selected as the team Most Valuable Player. Theo Riddick carries the ball as Graham breaks through the line during 2009 Michigan-Notre Dame rivalry game. Graham began the 2009 NCAA Division I FBS football season as a watch lists candidate for the Bednarik Award, Hendricks Award, Lombardi Award, Lott Trophy, and Nagurski Trophy for the 2009 Michigan Wolverines football team. He was also selected by ESPN as the 10th best player in the Big Ten Conference before the season started. He concluded the season as the Chicago Tribune Silver Football recipient as the Big Ten co-MVP (with Daryll Clark). He was the seventh defensive player to earn the award and second in the last 25 years as well as the first co-recipient. Graham was the first player from a losing team in eight years and only the second player to win who was not either Big Ten offensive or defensive player of the year. He posted 26 TFLs in 12 games, which led the nation with 2.17 average tackles for a loss per game (ahead of conference rival O'Brien Schofield who was second with 1.884). His total of 10.5 sacks ranked fourth in the Big Ten Conference. Four times during the season, he recorded multiple sack games and he had three solo TFLs in four games. He ended his career at Michigan with 9 TFLs (8 solo and 2 assists) in his final two games, including a career-high 5 solo TFLs against Ohio State in the 2009 rivalry game, which was the final game of his career. Graham was one of seven finalists for the Hendricks Award. At the conclusion of the season he was a 2009 First-team All-Big Ten selection by the coaches and media. He was a First-team 2009 College Football All-America Team selection by ESPN, Rivals.com and Scout.com, and he was a Second-team All-American defensive line selection by the Walter Camp Football Foundation, Associated Press, Sports Illustrated, College Football News and The Sporting News. He was an honorable mention All-American by Pro Football Weekly (which had no second team). Graham was again selected as the team MVP, which made him the school's first defensive player to be two-time MVP. As of December 2009, Graham was the only Big Ten player on Mel Kiper's "Big Board" Top 25. Brandon Graham earned MVP honors at the January 30, 2010 Senior Bowl with five tackles, two sacks, one forced fumble. At the NFL Combine, Graham ranked 8th among defensive linemen with a 4.72 40-yard dash and 10th in the bench press with 31. Brandon Graham pressures the Indianapolis Colts' Peyton Manning during a 2010 game. Graham was drafted by the Philadelphia Eagles 13th overall after trading up in the 2010 NFL Draft. Graham decided to wear number 54 for the Eagles immediately after the draft, but changed his mind and chose number 55. Graham shares the same sports agent (Joel Segal) as former teammate Michael Vick. He was the first Big Ten Conference player selected in the 2010 NFL Draft. He agreed to terms on a five-year contract on July 29, 2010. Graham recorded his first NFL sack against the Detroit Lions in a week 2 win on September 19, 2010. After suffering a torn anterior cruciate ligament (ACL) in a week 14 game against the Dallas Cowboys, Graham was placed on the injured reserve list on December 14. He underwent microfracture surgery on his right knee on December 21. Graham was placed on the active/physically unable to perform list on July 28, 2011, before the start of training camp. He was removed him from the physically unable to perform list so he could return to practice on October 24 and activated on November 5, 2011. In 2013, Graham moved from defensive end to linebacker. Many people had predicted he would become a linebacker at the pro level back when he was still in college. After coming close to signing with the New York Giants, in 2015 Graham signed a 4-year $26 million contract with $14 million guaranteed with the Eagles to remain with the team. Graham is married to Carlyne Graham. 1 2 3 4 5 "55 Brandon Graham". CBS Interactive. Archived from the original on 2011-03-06. Retrieved 2009-10-05. 1 2 "Big Ten Announces 2008 Football All-Conference Teams And Individual Honors: Iowa's Green Named Offensive Player of the Year, Ohio State's Laurinaitis repeats as Defensive Player of the Year.". CBS Interactive. 2008-11-24. Retrieved 2009-10-01. 1 2 "Big Ten Announces 2009 Football All-Conference Teams and Individual Honors". CBS Interactive. 2009-11-23. Retrieved 2009-11-24. ↑ "Football Five: Week 12". University Wire. 2008-11-13. Retrieved 2009-10-07. 1 2 Goricki, David (2004-11-17). "Humble Crockett aims high - School has limited facilities, but it also has a chance to win a state football title". The Detroit News. p. 01G. Retrieved 2009-10-02. 1 2 3 4 5 Markowski, Tom (2004-08-24). "Top Football Players - Graham believes in power of the hit". The Detroit News. p. 08E. Retrieved 2009-10-02. ↑ Markowski, Tom (2003-08-25). "Detroit Public School League". The Detroit News. p. 04C. Retrieved 2009-10-02. ↑ Markowski, Tom (2003-11-26). "2003 All-Detroit football team". The Detroit News. p. 05C. Retrieved 2009-10-02. ↑ Markowski, Tom (2004-11-24). "Every player helped team get spot in state playoffs - Top coach, Sterling Heights Stevenson's Bye, will be going for first championship". The Detroit News. p. 08E. Retrieved 2009-10-02. 1 2 Beard, Rod (2004-11-23). "2004 All-Detroit football team". The Detroit News. p. 10D. Retrieved 2009-10-02. ↑ Pryson, Mike (2004-11-23). "Back to the 'Dome - Lumen Christi earns seventh trip to Pontiac". Jackson Citizen Patriot. p. S1. Retrieved 2009-10-02. ↑ Abramson, Joe (2004-11-07). "Andover beats Lahser, 31-18 - Halfback amasses 244 yards and has three touchdowns in the playoff victory over crosstown rival". The Detroit News. p. 08D. Retrieved 2009-10-02. ↑ "OV back leads all-staters". The Muskegon Chronicle. 2004-11-26. p. C1. Retrieved 2009-10-02. ↑ "Brandon Graham". Yahoo! Inc. Retrieved 2009-10-01. ↑ "Brandon Graham". GoBlueWolverine.com and Scout.com. Retrieved 2009-10-01. ↑ Pryson, Mike (2005-11-04). "Christi, Crockett tangle in rematch of '04 game". Jackson Citizen Patriot. p. C4. Retrieved 2009-10-02. ↑ "Brandon Graham". ESPN.com. Retrieved 2009-10-01. ↑ Lawlor, Christopher (2005-06-09). "Football recruiting analyst logs plenty of miles, observations of talent". USA Today. p. 11C. Retrieved 2009-10-02. ↑ D'Alessio, Jeff (2005-12-18). "College Football Recruiting: National Top 25". The Atlanta Journal-Constitution. p. E5. Retrieved 2009-10-02. ↑ "Detroit Public School League". The Detroit News. 2005-08-24. p. 05G. Retrieved 2009-10-02. ↑ Monts, Rod (2005-10-19). "Crockett linebacker is rewarded for his plays - The senior is named to U.S. Army All-American team as Division I schools continue to recruit him.". The Detroit News. p. 12C. Retrieved 2009-10-02. ↑ Monts, Rod (2005-11-30). "Athlete aims for top award - Crockett linebacker is in the running for the national high school player of the year honor.". The Detroit News. p. 08S. Retrieved 2009-10-02. 1 2 Markowski, Tom (2006-01-15). "Crockett's Graham works hard, is humble". The Detroit News. p. 10C. Retrieved 2009-10-03. ↑ Heuser, John (2006-01-05). "Two new football recruits enroll early at Michigan". Ann Arbor News. p. D1. Retrieved 2009-10-03. ↑ "Mustain A Finalist For Parade Player Of The Year". Morning News of Northwest Arkansas. 2005-11-17. Retrieved 2009-10-02. ↑ Pryson, Mike (2005-11-06). "'They get it done' - Christi's methodical win earns praise from Crockett star". Jackson Citizen Patriot. p. E1. Retrieved 2009-10-02. ↑ "The Detroit News All-Metro Detroit". The Detroit News. 2005-11-21. p. 04D. Retrieved 2009-10-02. ↑ Khan, Bill (2005-11-25). "Two from area named Class B All-State". The Flint Journal. p. C08. Retrieved 2009-10-02. ↑ Markowski, Tom (2005-11-27). "The Detroit News Dream Team 2005". The Detroit News. p. 13C. Retrieved 2009-10-02. ↑ Bos, Jane (2005-11-29). "Three locals among state's Great 8 - Class A all-staters voted best at positions". The Grand Rapids Press. p. D7. Retrieved 2009-10-02. 1 2 McPherson, Chris (2010-04-23). "Obscure Rule Paved Graham's Road To NFL". Philadelphia Eagles. Retrieved 2010-04-25. ↑ Heuser, John (2006-10-24). "Ex-Pioneer swimmer earns award". Ann Arbor News. p. D5. Retrieved 2009-10-05. 1 2 3 Snyder, Mark (2007-08-11). "DE back in form after cutting coneys: Lighter Graham to start for U-M". Detroit Free Press. Retrieved 2009-10-06. 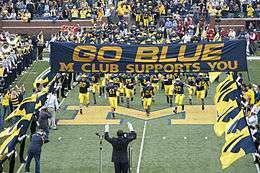 ↑ "College Football: 2006 Michigan Wolverines Roster". The Sports Network. 2006-08-16. Retrieved 2009-10-05. ↑ Heuser, John (2006-08-22). "Some positions still up for grabs - Unsettled spots on defense are strong safety, cornerback, weakside LB and end". Ann Arbor News. p. D5. Retrieved 2009-10-05. ↑ Carty, Jim (2006-09-03). "Henne's scrambles give offense a boost". Ann Arbor News. p. D5. Retrieved 2009-10-05. ↑ Heuser, John (2006-09-26). "Night kickoff is no favorite at U-M - 8 p.m. game against Minnesota alters Wolverines' schedule, pregame rituals". Ann Arbor News. p. D4. Retrieved 2009-10-05. ↑ Snyder, Mark (2007-08-02). "Freshman QB Mallett destined for greatness at U-M? : Henne has high hopes for one of the nation's top-rated incoming players". Detroit Free Press. Retrieved 2009-10-05. ↑ "Warrant issued for U-M defensive end". Ann Arbor News. 2007-09-26. p. B3. Retrieved 2009-10-07. ↑ Chengelis, Angelique S. (2007-09-27). "Disorderly conduct charges dismissed against U-M's Graham". The Detroit News. Retrieved 2009-10-07. ↑ Heuser, John (2007-08-08). "Overhauled and unproven - Needing 7 new starters, defense is the big question at U-M". Ann Arbor News. p. B1. Retrieved 2009-10-06. ↑ Heuser, John (2007-09-02). "Questions swirl around Michigan's porous defense". Ann Arbor News. Retrieved 2009-10-06. ↑ Snyder, Mark (2007-09-03). "Carr keeps it low-key in answering to opening loss". Detroit Free Press. Retrieved 2009-10-06. ↑ Heuser, John (2007-09-16). "Wolverines punish Irish - Michigan's resilient defense leads team to its 1st victory of the season". Ann Arbor News. p. B1. Retrieved 2009-10-06. ↑ Fenno, Nathan (2007-09-23). "Graham emerges as a force - Admonished after poor start, U-M defensive end now enjoys spotlight". Ann Arbor News. Retrieved 2009-10-06. ↑ "2007 Football Team". The Regents of the University of Michigan. 2009-05-09. Retrieved 2009-10-05. ↑ "The Automated ScoreBook: Individual Statistics Through games of Jan 08, 2008". CBS Interactive. Retrieved 2009-11-19. ↑ Shelton, Shannon (2007-10-23). "Ohio State sets sights on Penn State". Detroit Free Press. Retrieved 2009-10-06. ↑ Windsor, Shawn (2008-03-21). "Rich Rodriguez gives QBs equal reps; starter won't be named soon". Detroit Free Press. Retrieved 2009-10-07. ↑ Heuser, John (2008-08-09). "Slimmer Taylor set to be leader on U-M defense". Ann Arbor News. p. D1. Retrieved 2009-10-07. ↑ "Ohio State's Pryor could get early playing time - Tressel hopes to use freshman QB in opener". Ann Arbor News. 2008-08-27. p. B2. Retrieved 2009-10-07. ↑ Sharp, Drew (2008-08-27). "Whither Michigan tradition?". USA Today. p. 3C. Retrieved 2009-10-07. ↑ "Michigan celebrates 500th game in Big House with big win". ESPN.com. 2008-09-27. Retrieved 2009-10-07. ↑ "Michigan, Northwestern and Penn State Football Players Honored After Big Wins: Bachér, Graham and Williams pick up weekly football accolades". CBS Interactive. 2008-09-29. Retrieved 2009-10-07. ↑ Bigelow, Pete and Chris Iott (2008-10-26). "Graham plays well after his guarantee". Ann Arbor News. p. B6. Retrieved 2009-10-07. ↑ Ryan, Kevin (2008-11-23). "Graham isn't talking about NFL Draft yet; he focuses on U-M". Ann Arbor News. p. B6. Retrieved 2009-10-07. ↑ "The Automated ScoreBook: 2008 Big Ten Conference Individual Statistics Through games of Jan 09, 2009". CBS Interactive. Retrieved 2009-11-19. ↑ "Bowl Subdivision (FBS) National Player Report: Tackles for Loss: Year: 2008". National Collegiate Athletic Association. 2009-01-08. Retrieved 2009-11-22. ↑ "Bowl Subdivision (FBS) National Player Report: Pass Sacks: Year: 2008". National Collegiate Athletic Association. 2009-01-08. Retrieved 2009-11-22. ↑ "2008 Football Team". The Regents of the University of Michigan. May 2009. Retrieved 2009-12-12. ↑ Rittenberg, Adam (2009-05-29). "Ranking the Big Ten: Brandon Graham, No. 10". ESPN.com. Retrieved 2009-11-17. ↑ "Kelly has conversation with Notre Dame". The Detroit News. 2009-12-09. p. 2B. Retrieved 2009-12-14. 1 2 Greenstein, Teddy (2009-12-09). "Double winners twice as nice - Graham, Clark share honor as Big Ten's best". Chicago Tribune. p. 1, Sports section. Retrieved 2009-12-14. ↑ "Bowl Subdivision (FBS) National Player Report: Tackles for Loss: Year: 2009". National Collegiate Athletic Association. 2010-01-08. Retrieved 2010-01-08. 1 2 "The Automated ScoreBook: 2009 Big Ten Conference Individual Statistics Through games of Jan 08, 2010". CBS Interactive. 2010-01-08. Retrieved 2010-01-15. ↑ "Team: Michigan: Year: 2009 Thru 11/21/09: Player: Brandon Graham". National Collegiate Athletic Association. 2009-11-21. Retrieved 2009-11-24. ↑ "Michigan's Graham a finalist for Hendricks Award". Manistee News Advocate. 2009-12-03. p. 2B. Retrieved 2009-12-14. ↑ Maisel, Ivan (2010-01-14). "ESPN.com All-America Team (video)". ESPN.com. Archived from the original on 2010-01-19. Retrieved 2010-01-14. ↑ "Rivals.com 2009 All-America Teams". Rivals.com. 2009-12-15. Retrieved 2009-12-15. ↑ Safrit, Miller (2009-12-14). "Scout.com All-America Team". Scout.com. Retrieved 2009-12-15. ↑ "2009 Walter Camp All-America Team Announced". Walter Camp Football Foundation. 2009-12-10. Retrieved 2009-12-12. ↑ "2009 Sporting News college football All-American second team". Sporting News. 2009-12-15. Retrieved 2009-12-15. ↑ "Ingram, McClain lead 6 Alabama AP All-Americans". The Sporting News. 2009-12-15. Retrieved 2009-12-15. ↑ "SI.com's 2009 All-Americas". Sports Illustrated. 2009-12-15. Retrieved 2009-12-15. ↑ "2009 CFN All-America Defense & Special Teams". College Football News. 2009-12-16. Retrieved 2009-12-16. ↑ DeArmond, Mike (2009-12-21). "Pro Football Weekly's list of All-Americans includes Tigers and Wildcats". The Kansas City Star. KansasCity.com. Retrieved 2009-12-30. ↑ Chengelis, Angelique S. (2009-12-04). "U-M's Warren ponders declaring for NFL Draft". The Detroit News. p. 5B. Retrieved 2009-12-12. ↑ Pauline, Tony (2010-01-30). "Graham shines at Senior Bowl". Sports Illustrated. Retrieved 2010-02-01. ↑ "Brandon Graham Combine Profile", NFL.com, retrieved 2010-04-24 . ↑ "Results (40-yard dash)", NFL.com, retrieved 2010-04-24 . ↑ "Results (bench Press)", NFL.com, retrieved 2010-04-24 . ↑ Wulf, Bo (2010-04-23). "Brandon Graham, Nate Allen Jersey Numbers". Philadelphia Eagles. Retrieved 2010-04-25. ↑ McPherson, Chris (April 28, 2010). "Roster Numbers For New Players". PhiladelphiaEagles.com. Retrieved 2010-04-30. ↑ Leahy, Sean (July 29, 2010). "Philadelphia Eagles agree to deal with 13th overall pick Brandon Graham". USA Today. Retrieved 2010-07-29. ↑ "Eagles 35, (1-1, 1-0 away); Lions 32, (0-2, 0-1 home)". ESPN. 2010-09-19. Retrieved 2010-09-24. ↑ Meinke, Kyle (July 11, 2011). "notebook: Brandon Graham expects to miss start of NFL season and more notes from Jalen Rose's golf outing". annarbor.com. Retrieved 2011-07-20. ↑ McPherson, Chris (July 28, 2011). "Graham, Justice Placed On PUP". philadelphiaeagles.com. Retrieved 2011-07-28. ↑ Florio, Mike (2011-11-05). "Eagles activate Brandon Graham". NBC Sports. Retrieved 2011-11-06. ↑ Alper, Josh (2013-03-01). "Brandon Graham expects to move to outside linebacker". NBCSports.com. Retrieved 2013-05-31. ↑ Raanan, Jordan (2013-04-03). "Brandon Graham prepares to play outside linebacker for Eagles". NJ.com. Retrieved 2013-05-31. ↑ Birkett, Dave (2010-04-21). "NFL draft: At linebacker or defensive end, Brandon Graham should make an impact in NFL". AnnArbor.com. Retrieved 2013-05-31. ↑ McLane, Jeff (2015-03-10). "Eagles bringing back Brandon Graham; Frank Gore backs out of deal". Philly.com. Retrieved 2015-03-13. ↑ "Brandon Graham Stats". ESPN. ESPN Internet Ventures. Retrieved 13 February 2015. ↑ "55 Brandon Graham" (PDF). Philadelphia Eagles. Archived from the original (PDF) on 2015-04-02. Retrieved 2015-03-24. Wikimedia Commons has media related to Brandon Graham.